Home » Home & Kitchen » What Kind of Eye-Protection Desk Lights Is Worth to Choose? No matter for study or work, a good desk light is of vital importance not only for the purpose of a better reading environment but for eye care. It is said that the number of myopic people has reached up to 47% of the world, while with increasing pressure for study and work, and various electronic devices like TV, iPads, more and more children and businessmen suffer from Myopia, presbyopia or amblyopia. So, it is necessary to get an eye-protection table light for your children and your children. 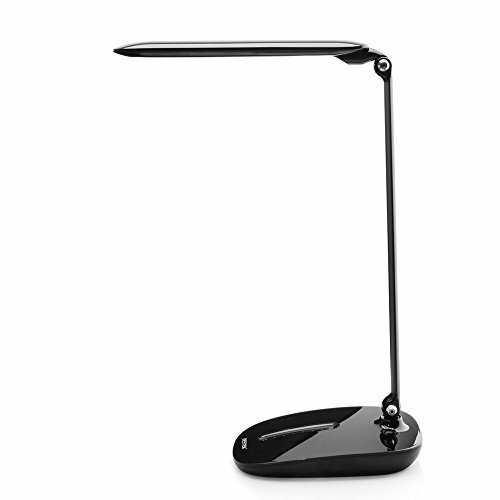 Among so many LED desk lights for reading, which desk light is worth your choice? Before making a decision, you need to keep in mind some factors about eye-protection reading lights. Pay attention to these factors when choosing an eye-protection desk light. The best illuminance of a desk light is 300lx to 750lx. Excessive brightness is so strong and fast that your eyes can’t avoid in time, thus getting directly into your eyes. That may bring harm to your eye’s lenses and retina. However, if the light is too dim, your ciliary muscle will keep in a nervous status, which could cause nearsightedness and ocular hypertension disease. Therefore, you should choose a desk light with suitable illuminance. If you want an energy-saving LED light, it is better to choose a light with 11W to 18W, or base on your personal comfort level. If the light shade on the desk is not uniformly distributed, your eyes should frequently adapt to the changeable light between bright and dim. In that case, your ciliary muscle is always in an unstable status, sometimes in tension and sometimes in relaxation. If your eyes can’t recover to normal, it is easy to get short-sighted. The retina is easy to get harmed when eyes suddenly see the high lightings. A certified reading light for the table should be designed with lens, grid and other protection devices against glare. To avoid glare, you’d better not choose a light with external bulbs. To check your light whether it is anti-glare, you can look at the lamp in a place 400mm above and 600mm near to your eyes. If you can’t see the bulb, then it means your desk light is non-glare. The same as non-uniform distributed light, flickering can also lead to shortsightedness or ocular hypertension. According to CIE international standard, the flicker frequency of desk light should be over 25000rpm. But high light flicker frequency will cause electromagnetic radiation, so choose a table light with EMI/EMC listed. Many light sources can make objects change colors. If color changes to a certain level and keeps it for a long time, there will be more bad effects on your eyes. Based on the standard of CIE, the color rendering index of a good desk light should be over 80%. Check the specification on the product when you choose a table light. Neither low color temperature nor high color temperature is good for your eyes. Your eyes can’t feel enough brightness if the color temperature is too low. But if the color temperature is too high, your eyes are easy to get fatigue and get eye diseases. The suitable light for reading should be close to natural light with 3300K to 5500K. Some reading lights may have adjustable lighting modes with different color temperature to fit for other occasions. The above few factors may help you know what you should know about a good table light for eye care. There are many eye-protection desk lights for your option. On the basis of the eye-protection feature, you can also choose one with other unique features. 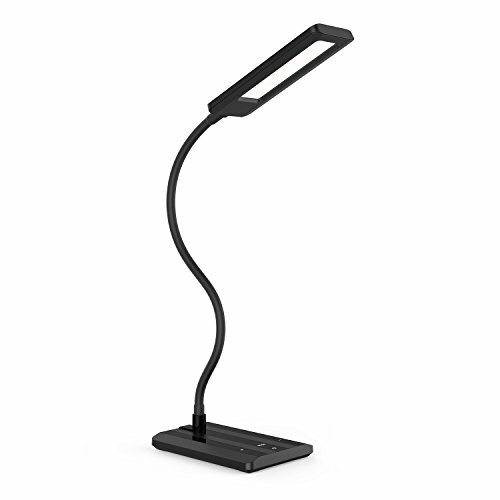 Gooseneck desk light is much flexible than other types of table lamps. The metal collapsible gooseneck tube is bending-resistant to make the lamp adjustable to any angle as you like, a real sense of 360°rotatable. It is easy to have the best viewing angle by one hand adjusting. 4 color temperature / 4 brightness levels / Luminance: 1400Lux, 80lm/w / Lifespan: 40000 hours. 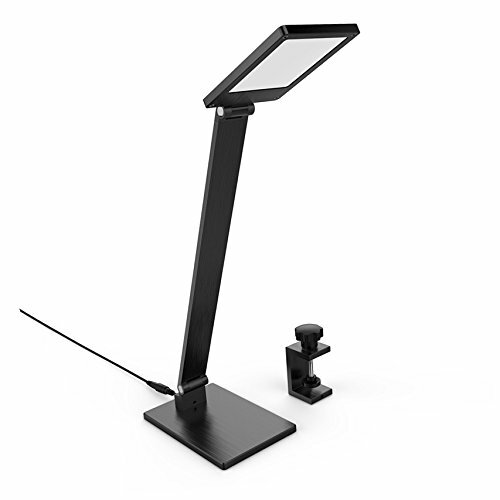 The detachable desk lamp is dual-functional and easy to maintain. Some part of the lamp body can be removed off so that you can clean it completely. The lamp head of some desk lights can be used as a handheld flashlight when you detach it. 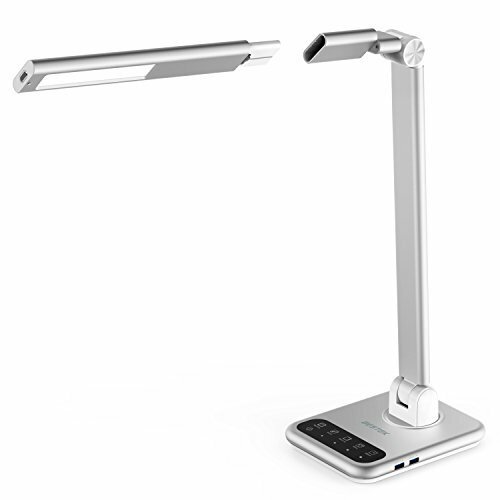 BESTEK detachable desk lamp comes with a removable head that ensures 3 adjustable brightness levels and 90mins long working time when used as a flashlight. 4 lighting modes / Color temperature: 2700-6500K / Color Rendering Index: ≥80 / Lifespan: 10000 hours / Other features: USB ports, timer. Most of the desk lamp can only stand on the desk with an ant-slid base. In recent years, you can also find many other desk lamp installations with clamps or grommets. A multi-way installable reading lamp makes it much easier for you to use and meet your different needs. A clip-on desk lamp can be mounted by clamps on the desk, shelf, edge of the bed or any edge of planes. 3 brightness levels / Color temperature: 5500-6000K / Color rendering: > 80 / Illumination: 400mm 750 Lux / Lifespan: 60000 hours. Architect desk lamps were originally ideal for architect’s office as the lamp had an adjustable head and stems to help light up blueprints in any angle. Architect desk lamps are also called drafting lamps and task lamps. But now such lamps which are simple in design and functional can also fit in any home or office decorations. 7 brightness levels / Color Temperature: 5500K—6500K / Color rendering: > 80 / Illumination: 350 Lux / Lifespan: 30000 hours. The cover for LED lights has few benefits. It can keep out the strong lightings and protect the lights from dust and cooking fumes to keep the lamp clean and prolong its lifespan. It can also protect kids from lights to avoid electrical shock. 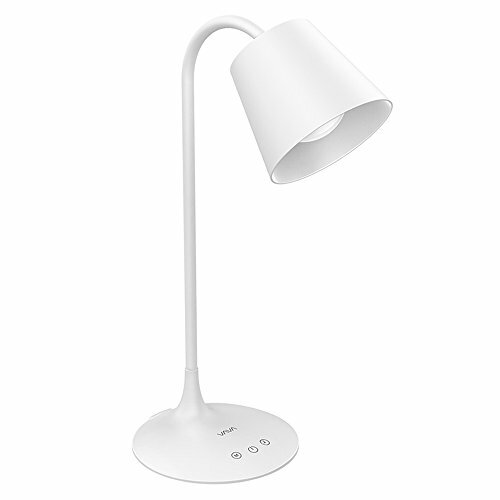 The cover desk lamp can’t provide wider lighting area, but suitable for small room studying or individual working. 3 color temperature / Color rendering: > 80 / Illumination: 650Lux / Lifespan: 50000 hours. 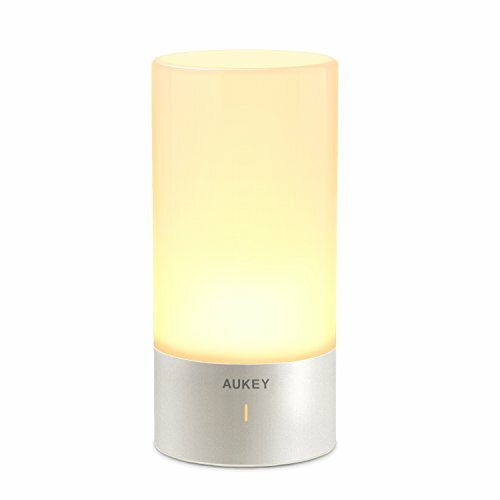 Color changing table lamps are perfect for the bedroom, living room, and modern offices. Most color changeable lights are touch activated and provide you several background lightings to fit for different occasions, not just for reading, working or sleeping. Touch sensor table lamps can also help you to save more energy. 6 changing colors / Color temperature: 2900–3100K / Color Rendering Index: ≥80 Ra / Illumination: 450Lux. To protect your eyes, you need a good eye-protection table lamp. To choose a suitable LED desk light for study or work, you have to learn something about illuminance, color, temperature and color rendering, etc. There are also many desk lamps with different designs and features. Decide one based on your own needs and taste.